Kyani continues making waves with their proprietary full spectrum health triangle. Exciting new changes to the formulation have made Kyani an even more effective trio of products in the health marketplace. The Kyani Health Triangle include Kyani Nitro, Kyani Sunrise, and Kyani Sunset which together work synergistically to create an unmatched source of nutrition for optimal well being. Kyani’s Health Triangle components independently deliver wild Alaskan blueberries, vitamin E tocotrienols, Omega-3 fatty acids, and noni plant-based nitric oxide in a simple system. The Kyäni Health Triangle maintains, defends, and repairs every cell in the body. The sum of the three products is more important than one product itself. Kyäni as a company is unique in the industry. There is no other company that has a Triangle of Health, or a model like Kyäni has, to create global wellness. Kyäni Sunrise™ contains 27 mg of Vitamin B-1 per 1 oz. serving. Kyäni Sunrise™ contains 1.7 mg of Vitamin B-2 per 1 oz. serving. Kyäni Sunrise™ contains 30 mg of Vitamin B-3 per 1 oz. serving. Plays a role in the production of bile, vitamin D, red blood cells, adrenal gland hormones, and neurotransmitters. Kyäni Sunrise™ contains 125 mg of Vitamin B-5 per 1 oz. serving. Kyäni Sunrise™ contains 25 mg of Vitamin B-6 per 1 oz. serving. Furthermore, a new study published in the journal, Neurology, shows that deficiencies in Vitamin B-12 are associated with memory and thinking problems, as well as brain shrinkage that may contribute to cognitive problems. Kyäni Sunrise™ contains 200 mcg of Vitamin B-12 per 1 oz. serving. Kyäni Sunrise™ contains 60 mg of Vitamin C per 1 oz. serving. 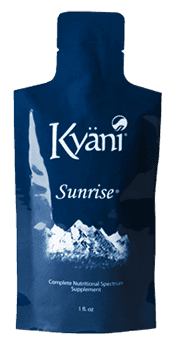 Kyäni Sunrise™ contains 400 mcg of Vitamin B-9 per 1 oz. serving. Kyäni Sunrise™ contains 150 mcg of Biotin per 1 oz. serving. Kyäni Sunrise™ contains 25 mg of PABA per 1 oz. serving. Kyäni Sunrise™ contains 1,000 mg of Taurine per 1 oz. serving. Kyäni Sunrise™ contains 100 mg of L-Theanine per 1 oz. serving. Kyäni Sunrise™ contains 25 mg of Inositol per 1 oz. serving. Kyäni Sunrise™ contains 50 mg of Trace Minerals per 1 oz. serving. 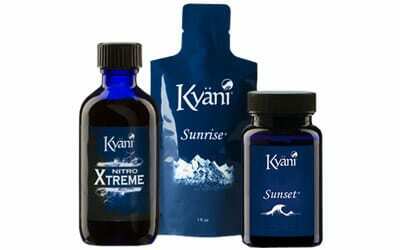 Kyani Sunset contains only lipid-soluble elements, which maximizes the bio-availability of these nutrients. Kyani Sunset is a proprietary blend of Vitamin E tocotrienols (the most potent form of vitamin E), Omega-3s fish oil from Wild Alaskan Sockeye Salmon (one of the purest sources of fish oil from salmon), beta carotene (a natural source of Vitamin A), and Vitamin D which recent scientific studies is showing to be extremely essential for optimal health and prevention of many illnesses. The various health benefits of individually taking tocotrienols, Omega-3, Beta Carotene, and Vitamin D have been documented by medical professionals and researchers across the world. 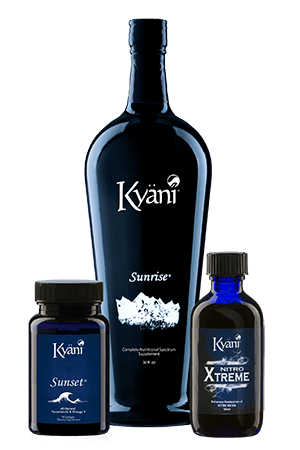 Kyani Sunset offers an unmatched delivery of nutrition to the body’s vital systems. 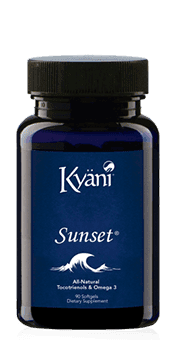 Since Kyani Sunset is comprised of only lipid-soluble nutrients, Kyani Sunset is designed for use at night when the body’s lipid activities are at their peak and the body is resting. Kyani Sunset is the best lipid-soluble complement to the water-soluble nutrients offered by Kyani Sunrise. The Kyani Health Triangle—Kyani Sunrise, Kyani Sunset and Kyani Nitro FX—works synergistically to defend, repair, and maintain your best health. These simple instructions will allow you to “Experience More” with Kyani. Step 2: Drink Kyani Sunrise (1oz./2 tbsp.) in the morning to provide essential vitamins, trace minerals, and anti-oxidants. Step 3: Take Kyani Nitro FX (one 1 mL dropper) in the early afternoon for an extra energy boost, approximately 5-6 hours after your morning routine. Step 4: Take Kyani Nitro FX (one 1 mL dropper) before Kyani Sunset to prepare your body for Kyani Sunset. Step 5: Consume Kyani Sunset (3 gel caps) with dinner for optimal absorption and to allow the powerful Tocotrienols and omega-3s to help restore your body during sleep. Sunrise has Taurine. Is that good to take? Noticed the energy drinks such as Red Bull has taurine and I’m against energy drinks and its contents. Hi DK, I can only give you my personal opinion and I have never noticed negative side affects from taking Sunrise. I encourage you to read more about Taurine: https://en.wikipedia.org/wiki/Taurine and http://www.globalhealingcenter.com/natural-health/dangers-of-taurine/.